In the inaugural issue of Knight Frank’s global report, Urban Futures, Mumbai has recorded the third highest growth in annual household incomes over a five-year period (2014 – 2018). Mumbai has recorded a rise of 20.4% in annual household incomes in the period of study. 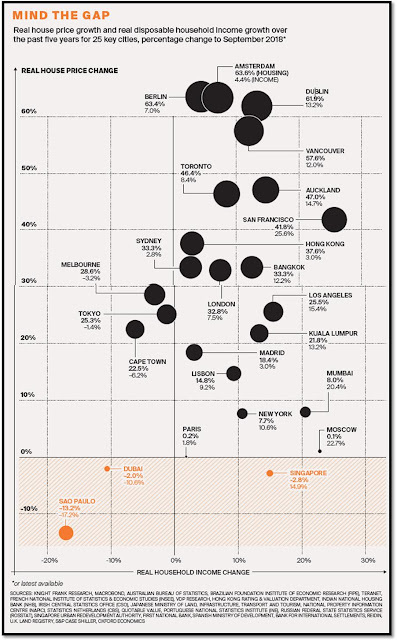 The growth in housing prices in the same period in Mumbai has been estimated at 8% only. San Francisco in USA saw the highest rise in annual income at 25% in the five-year period while Amsterdam at 63.6% (Netherlands) recorded the highest rise in housing prices between 2014 – 18. The report evaluates 32 cities across the world to understand the difference between house prices and income and estimates the gap to be US$740 billion in 2018. Despite being India’s most expensive real estate market, Mumbai emerged among the more affordable cities amongst its global peers. Mumbai has seen real household income growth outpace real house price growth by 12.4%, indicating an improvement in affordability. The real house prices in comparison have grown at a much slower pace of 8% while the real disposable household income growth was over 20.4% in the five-year period ending 2018. The affordability in the city have improved on account of reduced size of units with largely stable prices. Consistent reduction in apartment sizes has also lowered the average ticket price for Mumbai. It is estimated that on an average, newly launched homes are smaller by 25% between 2014 - 18. Maximum launches, especially in the last two years (2017 and 2018) have been in the affordable and mid ranged segment with ticket prices not exceeding INR 7.5 Million (75 Lakhs). As part of the Urban Futures report, Knight Frank has launched its Global Affordability Monitor, which analyses affordability across 32 cities. It takes into consideration three key measures – house price to income ratio, rent as a proportion of income and real house price growth compared to real income growth. Across the 32 cities, there was an average five-year real house price growth of 24%, while average real income grew by only 8% over the same period. Overall, New York saw its income growth exceed real house price growth by 3% while Moscow, Singapore, Mumbai and Paris also saw their average real income over the last five years grow faster than real house prices. Moscow saw the largest difference where real income growth outpaced real house price growth by 22%. Knight Frank LLP is the leading independent global property consultancy. Headquartered in London, Knight Frank has more than 18,170 people operating from over 523 offices across 60 markets. These figures include Newmark Grubb Knight Frank in the Americas, and Douglas Elliman Fine Homes in the USA. The Group advises clients ranging from individual owners and buyers to major developers, investors and corporate tenants. For further information about the Company, please visit www.knightfrank.com. In India, Knight Frank is headquartered in Mumbai and has more than 1,000 experts across Bangalore, Delhi, Pune, Hyderabad, Chennai, Kolkata and Ahmedabad.